Sharepoint Online, Follow-up WorkFlow is it possible? I need the SharePoint to automatically pick the information from the "Email" column and send the user in the e-mail a notification." Is this possible? When you select the 'To' field you should see a link called 'Add dynamic content'. Select the link and click on 'See More'. It should show all the fields available for the current item being processed. In below screenshot 'EmailTo' is the people and group column in the list. On SharePoint Online are OOTB functions for automatically notifications. Look at this link https://support.office.com/en-us/article/get-notified-of-list-changes-in-sharepoint-online-85ca9280-f4b1-485a-a49e-a593ffa62e39 as set for users. 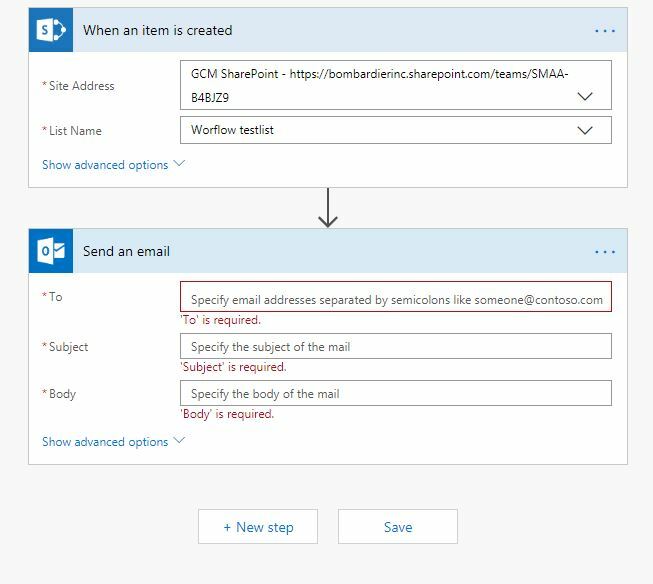 Yes, you can create SharePoint workflow with SharePoint designer, where you will send email to the CurrentItem:Property[Email]. It can be easily done by using SharePoint Workflow. Click “this message” in the “Send an Email” action. Click “OK” and define the body of the email as you like. When you click in the "to" field (or any of the fields), a panel should open up that has a list of the available fields from the "when an item is created" action. However, it will only list fields of the appropriate type. So clicking in "subject" should list all the fields, as that's just a string. Clicking in "to" will list only "person" fields by default. If your "email" field is a person field, all you should have to do is select it. If it is a text field, you will need to click on a button/link that says "see all options" (I think, that's going from memory), at which point it should list all fields. Be warned, however, doing this will make the workflow brittle, as it will fail anytime someone doesn't enter a valid email. Not the answer you're looking for? Browse other questions tagged sharepoint-online flow or ask your own question.